Grizedale Forest and Hermiston B&B. On our journey north towards our bed for two nights, I planned an excursion to Grizedale Forest. It was the perfect opportunity to look for the colours of autumn. However, the day dawned grey and oppressive. Indeed all weekend the weather forecast was for heavy cloud cover. Grizedale is the UK’s first sculpture forest and while David and I walked the route towards Carron Crag we looked for sculptures en-route. The walk to Carron Crag took two hours. There are many other walks, some strenuous, others less so. Our visit was brief but Grizedale is definitely a place to re-visit. Have you been? What did you think of the place? Grizedale was an hours drive from our B&B, Hermiston Guest House. Hermiston is situated in the quiet village of Braithwaite, just 10 minutes drive from Keswick. On arrival we were met at the door by Helen who welcomed us inside. She carried my suitcase and showed us to our room, Skiddaw. The room was well appointed, in neutral colours with an en-suite (the shower was lovely!) The window opened to glorious views of the Skiddaw mountain range. While we chatted about my wild swims over coffee, tea and cake in the guest lounge, Helen informed us that she had left me a gift for my birthday from herself and husband Phil. I was astounded by their generosity. They had gifted a bottle of bucks fizz! I was warmed by their kindness! David and I had planned on an early rise the next morning, meaning we would miss breakfast. Helen offered to make me a fruit salad to take on my travels, which I kindly accepted. Even breakfast the day after was a relaxed and friendly affair. Phil served the meals and friendly chatted to the guests, showing real interest and giving suggestions on places to visit. Helen and Phil made us feel very welcome in their home. David and I really enjoyed our stay and would recommend their B&B. It would be nice to visit again in the future. I can’t wait to write up and tell you all about my next adventure. Our full day in the Lake District was EPIC! 14 hours of wondrous sights and experiences! Do continue to follow me as I recount my short but wonderful trip to Cumbria. This week I have been out and about a little bit more than in previous weeks. While going for a coffee with mum, doing some temporary note-taking work and meeting up with a friend for lunch, I kept one eye looking for signs of autumn. Slowly but surely Liverpool is becoming enveloped by autumnal colours. I took a leisurely walk around the University of Liverpool campus and visited Abercromby Square. Though still looking verdant, the tree tops are slowly turning golden. I also came across a Barbara Hepworth sculpture and one by Hubert Dalwood. Since I have been getting up before the sunrise this week, I have seen some lovely skies. Though the days (and especially the mornings) have that bitter chill to the air, there are still plenty of honey bees visiting the salvia. On Thursday I met a friend in town. As I was standing waiting for the bus, a robin sat atop a gravestone in the nearby cemetery and sang to me sweetly. I just wish I had taken a photo of him, his presence filled my heart with gladness. My friend and I took in a visit of the World Museum, which boasts a planetarium among its many assets. This got me thinking of the northern hemisphere’s night sky in autumn. On a clear night looking north most people can identify the Plough, (Ursa Major), which points to the pole star, Polaris. Looking south, the square of Pegasus is deemed the main autumn constellation. However, for me, the most autumn constellation is Orion to the east. October is also the time of year for the Orionids, the remnants of Halley’s Comet. This meteor shower ranges between 16th – 26th of the month, peaking on the 21st. And finally, I have found some informative resources on the Forestry Commission website. Follow the link for activity packs, mindfulness poems and an interactive map, showing the changing colours of various forests in the UK. I’ll end this week with a recording of Tchaikovsky’s Autumn Song. Have you been following the changing seasons? What, if anything do you like about this time of year? WARNING! This post will be a COLOUR overload! I was inspired to write this post after visiting Sheffield’s herd of elephants and writing about it in my Sunday Sevens #15. Mark at worldwarzoogardener1939 commented that Paignton Zoo are doing a trail with rhinos and Marwell Zoo have Zany Zebras gracing the streets of Southampton this summer! I would love to visit them all but 2016 seems to be the busiest year regarding animal street art in the UK! One of the biggest promoters of these events is Wild in Art, check out their website for past and future events. Over the past eight years David and I have been lucky enough to visit a fair amount of trails, stretching as far north as Aberdeen, to Norwich in the east! My first encounter with these colourful animals was the Manchester Cow Parade in 2004. Since then there has been an explosion of animals gracing the cities and towns of the UK. From lions in Bournemouth to horses in Hamilton. Below is a selection of the trails we have seen. Enjoy! 2008 was the year of Liverpool’s Capital of Culture. During the summer, 120 6ft lambananas graced the city’s streets. I have fond memories of seeking each and every one of them out, there was even one atop Moel Famau in North Wales! The winter of 2009 saw 135 5ft penguins bring cheer to the cold streets of Liverpool, St Helens and the Wirral. I don’t think they were as successful as the lambananas the previous year, even David seemed jaded in seeing them all. However I managed to capture them all on camera and even a few months after the auction date, acquired one for myself. A hint of madness but our home wouldn’t be the same without Snowy standing sentinel under the stairs! Staying in the North West, Chester in 2010 had a herd of rhinos career through their streets. ..and we visited Newport for the first of their two Super Dragon trails. 2011 saw two very diverse trails. The first was in Congleton where a sleuth of bears had taken up residence. The second was in Edinburgh, where the city was transformed into a jungle for the summer. In 2012 it looked like David and I never visited any art trails, though in fairness we did buy our first house! 2013, looked more promising! My appetite was reawakened when I saw some of the Lindt Easter eggs. You can read my post here. The summer of 2013 saw us visiting a spate of trails. We visited Manchester for the national tour of the Elephant Parade. Read my post here. We then visited Norwich and Colchester to see both Go Go Gorillas and Stand Tall trails. 2014 saw David and I take a tour to Aberdeen, Scotland to see their pod of dolphins in torrential rain! Read my post here. 2015 saw us returning to Norwich to see their Go Go Dragons trail. I am always impressed with the quality of art from this city! I look forward to seeing what their hares look like in 2017! Also in 2015 Liverpool had their celebration of ducks which commemorated the history of the city. While Birmingham witnessed a parliament of owls in their Big Hoot! As I’ve said previously 2016 will see more trails than ever before. There are pigs in Ipswich, snowdogs in Brighton and Hove and Newcastle and Tyne and Wear, and lions in Paisley. That is just to name a few! Sheffield’s herd of elephants are on the streets until 5th October when they will be auctioned off for charity like most of the above. They are a great way of getting the public behind a charitable cause and can raise hundreds of pounds! Have you seen/followed any animal sculpture trail? What do you think of the initiative? What kind of animal would you like turned into art next? I have previously written about the 14-18 NOW Wave and Weeping Window poppy tour. You can read my post on my joy at seeing the Wave at Yorkshire Sculpture Park, here. Both sculptures were designed by Paul Cummins (artist) and Tom Piper (designer). In November, just in time for the city’s Armistice commemorations, the poppies, first seen as part of the breathtaking Blood Swept Lands and Seas of Red, at the Tower of London in 2014, finally came to Liverpool. The Weeping Window at present graces the St George’s Plateau side of the Neo-Classical Grade 1 listed building. I must admit while the sculpture was being constructed I was not overtly taken by the design. After seeing pictures of the poppies at Woodhorn Colliery, it seemed somehow anticlimactic. However the poppies have grown on me and the city has welcomed them warmly. The second time I visited, I went with my Mum while Christmas shopping but once again I forgot to change the setting on my phone, so never got any fancy ones with just the colour of the poppies showing through. It was a dreary day light wise too which seems to be the norm of late. No sooner had the poppies arrived in Liverpool, then there seems to have been nothing but a succession of storms. There hasn’t been many days when the sun has shone! I live in hope that there will be at least one bright weekend, before they leave the city on 17th January 2016, so David and I can visit them one last time. If you have not had the chance to see the poppies, maybe you will be able to see them at these stunning new locations next year? Thursday dawned bright, yet cold, there was condensation on the windows. David and I, at 9 am set off on our journey to Yorkshire Sculpture Park. The journey took us just under an hour and a half and the sat nav guided us through winding country lanes towards the park. We have been to the park before in April this year. We went then to see the outside exhibition of Henry Moore sculpture. This time we planned to go and see The Wave, part of the Tower of London Poppies. Like everyone else I was mesmerised by photographs of the poppies that graced the Tower of London last year. I was excited when it was announced that the poppies were going on a UK tour! 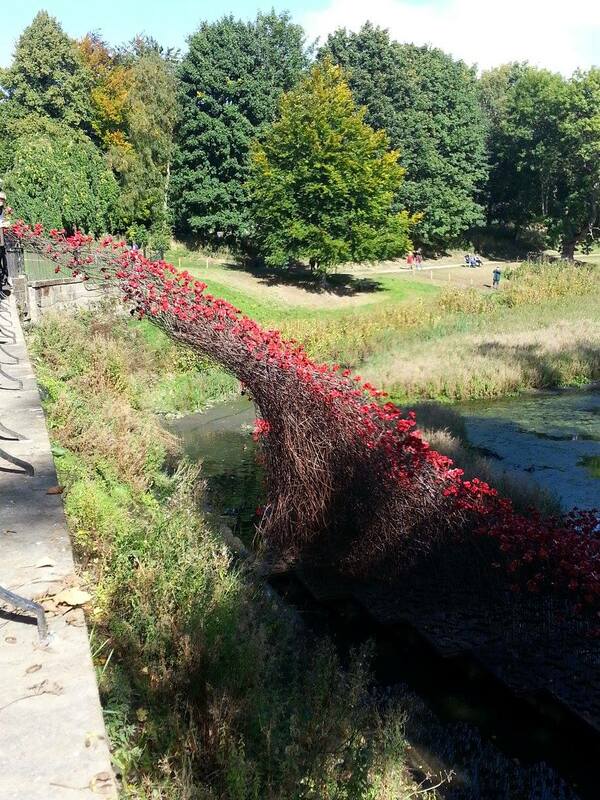 The poppies were created by artist Paul Cummins and designer Tom Piper for their installation Blood Swept Lands and Seas of Red, commissioned for the World War One centenary. I think their work of thousands of poppies, each one symbolising a fallen British or Colonial soldier took on a life of it’s own. If you expect to see a sight like there was at the Tower of London, then you will be sorely disappointed. If, like me, you go to visit The Wave, and it’s counterpart The Weeping Window, presently displayed at Woodhorn Colliery, Northumberland, to see a unique art installation, then you will not be disappointed. Once the car was parked and the £8 parking fee was paid (it’s for all day so relatively cheap), we walked the paths and followed the cardboard cut outs of poppies leading the way. 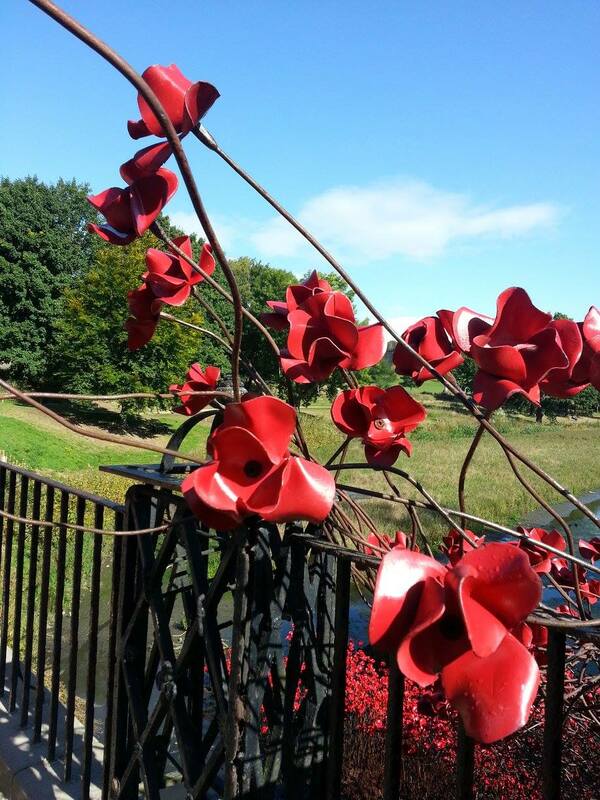 It took us about 20 minutes to walk towards the poppies arching over the Cascade Bridge. From a distance you could see the red haze that the many poppy heads created and as you drew nearer, each one had a unique individuality. We spent just over two hours at the park. Had our picnic lunch with The Wave resplendent before us. Even on a week day there were streams of visitors coming to look at the poppies, to photograph them or to just take in their symbolic meaning. 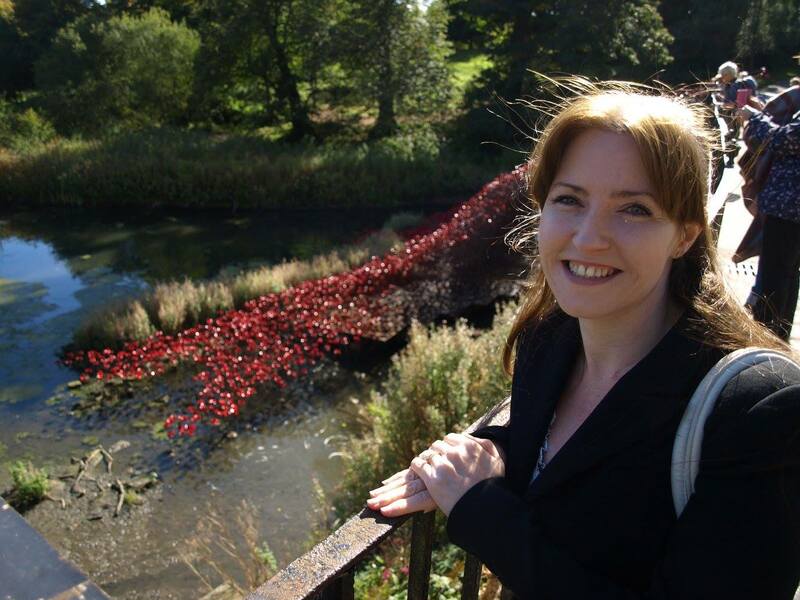 I’ll end this post with the poem that inspired the poppy WW1 centenary art commission. Where angels dare to tread. Fields so far from my love. To sleep and cry no more. I may not come back So sleep, kiss the boys for me.